Rena Takeda (武田 玲奈, Takeda Rena), nicknamed Renarena (れなれな), is a Japanese actress and model who is affiliated with Vithmic Co., Ltd.
Rena Takeda was born in Iwaki, Fukushima in 1997. In December 2013, she won a competition named "Seeking a second Kumicky" from among the 2,020 applicants. She was an exclusive model in Popteen from February 2014 to April 2016. Since the June 2016 issue, she has been an exclusive model of Non-no. ^ 武田玲奈（れなれな） [Rena Takeda] (in Japanese). 月刊Popteen. Archived from the original on July 28, 2015. Retrieved March 20, 2016. 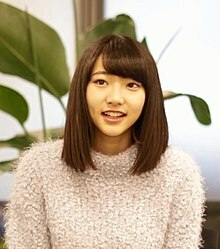 ^ "武田玲奈さん16歳　第２のくみっきー誕生" (in Japanese). nikkansports(Dec 16, 2013). Retrieved Mar 22, 2016. ^ a b c 武田玲奈、『non-no』専属モデルに「最年少なので、皆さんに食らいつく」 (in Japanese). oricon ME inc. Retrieved 2016-04-20. ^ "映画『のぞきめ』公式サイト" (in Japanese). Retrieved Mar 22, 2016. ^ "ポエトリーエンジェル". eiga.com. Retrieved March 24, 2017. ^ "武田玲奈の人気と知名度が急上昇" (in Japanese). livedoorNEWS(Dec 17, 2015). Retrieved Mar 22, 2016. ^ "Prison School's live-action cast appears in costume, looks the part of its anime inspiration". rocketnews24(Sep 09, 2015). Retrieved Mar 22, 2016. ^ "加藤シゲアキ、短編小説集がドラマ化! 『傘をもたない蟻たちは』" (in Japanese). RBB Today(Nov 17, 2015). Retrieved Mar 22, 2016. ^ "武田玲奈、泡風呂で美ボディ披露　自身初の挑戦" (in Japanese). modelpress(Feb 26, 2016). Retrieved Mar 22, 2016. ^ "三代目JSB「ポッキー」CMに話題の美女・武田玲奈参戦 恋するJK役が可愛い" (in Japanese). modelpress(Jan 18, 201 6). Retrieved Mar 22, 2016. ^ ツインテールと機関銃 (ファミマ・ドット・コム): 2014 (in Japanese). National Diet Library. Retrieved 2016-04-20. ^ 2月2日ツインテールの日、通算4冊目の写真集『ツインテールと機関銃』発売決定 (in Japanese). Mynavi Corporation. Retrieved 2016-04-20. ^ カープガール = CARP GIRL (マイナビ): 2014 (in Japanese). National Diet Library. Retrieved 2016-04-20. ^ 急増する カープ女子 を収めたカープ承認の写真集『カープガール』8/29発売 (in Japanese). Mynavi Corporation. Retrieved 2016-04-20. ^ 武田玲奈、初写真集が部門首位 スク水＆泡風呂に挑戦 (in Japanese). oricon ME inc. Retrieved 2016-04-20. This page was last edited on 20 March 2019, at 17:31 (UTC).